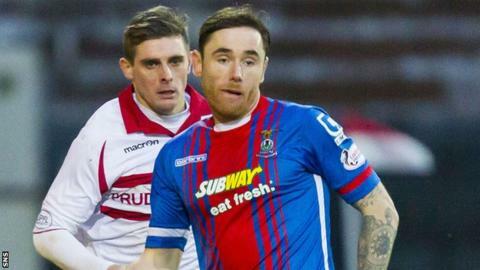 Inverness Caledonian Thistle manager John Hughes insists his club had every right to fight to keep Greg Tansey. Aberdeen failed with a deadline-day bid for the midfielder, despite thinking they had triggered a release clause in the 27-year-old's contract. Caley Thistle say the player chose to remain where he is. "I think we had to show the supporters that we're not just going to roll over and get our belly tickled," Hughes told BBC Scotland. "Greg Tansey is our player and we told him how much we value him. "Just so happens the window comes and goes, we wake up in the morning and Greg Tansey's still an Inverness player." Inverness lost Graeme Shinnie to Aberdeen under freedom of contract last summer, while Jonny Hayes, Barry Robson and Adam Rooney are other former Caley Thistle players now at Pittodrie. Dons manager Derek McInnes said he was "surprised and disappointed" that a £200,000 offer for Tansey failed. However, Hughes insists that he managed to convince the player that his immediate future lay with Inverness as they continue the defence of their Scottish Cup triumph away to Motherwell this Saturday. "The most important thing is everything for me was done above board," said Hughes. "You must be doing something right if teams like Aberdeen are coming for your players. "It was just about us convincing Greg Tansey this was the place for him right at this moment in time and we did that. "Greg knows he's a very big part in what we do. He's the one that gets us started, gets on it, great range of passing and it was important that he stayed at this moment in time. "I think he's got great trust in myself that I know what's best for him. "He's won a Scottish Cup here. Why not go and do that again?"